l Lauri, here is a summary of what I've discovered about your video of the Fairview UFO. Sorry about taking so long to get back you about your UFO video. I wanted to have a few other people who own video cameras take a look at it (and the stills) and get their opinions........... Anyway, here is a summary about what was determined about the video. First, whatever you were taping was something happening on the ground. I was looking at the end of the sighting where you showed the lights of Mt. Pleasant and then pan north to Fairview. 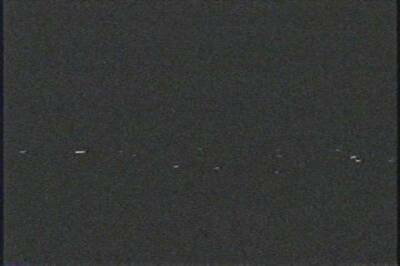 I noticed a section south of Fairview where the lights exactly matched the UFO lights you were taping. Compare the two pictures below taken from the video. l Some thought that one of the small moving white lights was a car that was going east on a road and then turned north and then faded out because you couldn’t pick up the lights from the side of the car. The moving lights on the right seem to be from cars on the south end of Fairview. 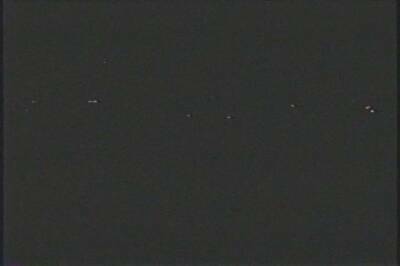 Everyone thought that the bigger UFO video was caused by the camera not being able to focus at night. Video cameras are well known for their horrible ability to focus on lights at night. When you mentioned that when you lost it when trying to zoom in or out on it, that pretty much convinced them that it was caused by the camera trying to refocus and then locking on an out of focus image that had a sharp edge around it. Again, this is a common problem with video cameras. l But there were still some images that are pretty strange and got me very excited when I first saw them. Please take a look at the attached pictures for more details. As for what you were actually taping is still up in the air. Because of the color of the lights, some thought it may be a utility crew with the yellow lights on their trucks. It may have been some farmers or ranchers working out in their field. But, because the light just faded out, it appears the source was a normal (but very bright) light bulb that faded out after being turned off. I hope you’re not too disappointed about this report. When I first started going through it I was really excited about what I was seeing. Unfortunately, after going through the video closely I slowly realized that this was probably not a UFO and got a bit bummed about it. There is still a little bit of hope though, no one can say for certain what those lights were. Let me know if you have any questions. If you didn’t get the pictures or want more (I have over 60 stills that I took from the video) let me know and I’ll get them to you, either through email or on a CD. Thank you again for you help. 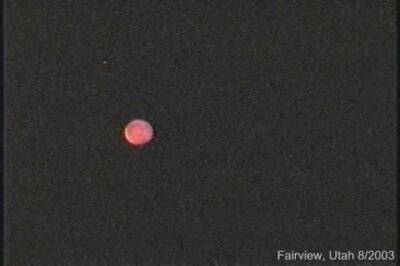 Witnesses were observing ground lights, and the parts of the video showing a large red sphere was due to the auto-focus being on and when subject / target goes off center the camera tries to regain focus or find target which is a common 'mistake' for filming at night. Witnesses should always use manual focus when filming or taking pictures at night, and make sure (take note) of the horizons position in relation to the target being observed. 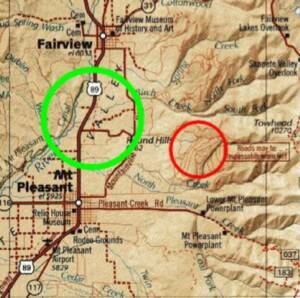 the green circle is the area where the sighting occurred.